This tapestry-style pattern, worked in soft glacial colors, gives cool, classy style to this felted tote. 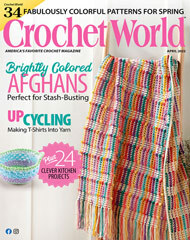 This e-pattern was originally published in the December 2011 issue of Crochet World magazine. Size: 12" x 13" x 4", excluding handles. Made with medium (worsted) weight wool yarn and size K/10 1/2/6.5mm hook.